A bad storm, two cancelled flights, trapped with the guy who broke her heart…Shani Petroff delivers laugh out loud comedy and unforgettable disasters in this highly relatable comedy of errors about a teen stuck in an airport with her cheating ex. 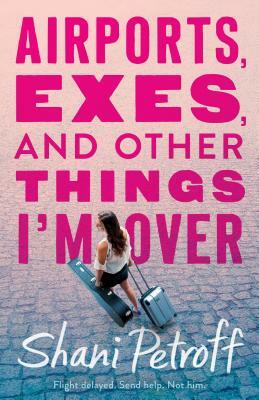 Chosen by readers like you for Macmillan’s young adult imprint Swoon Reads, author Shani Petroff looks at both heartbreak and forgiveness in her latest YA comedy of errors, Airports, Exes, and Other Things I'm Over. Shani Petroff is a writer living in New York City. She is the author of Romeo and What's Her Name, My New Crush Gave to Me, and the “Bedeviled” series, which includes Daddy’s Little Angel; The Good, the Bad, and the Ugly Dress; Careful What You Wish For; and Love Struck. She is the co-author of the "Destined" series, which includes Ash and Ultraviolet. She also writes for television news programs and several other venues. When she’s not locked in her apartment typing away, she spends a whole lot of time on books, boys, TV, daydreaming, and shopping online.